BAHRG members have taken part in archaeological excavations in residents’ gardens over a number of years, thanks to the generosity of the house-owners! Artefacts have been found from many periods of history: Neolithic, Roman, Medieval, Tudor, Georgian up to the present day. We have even found an underground tunnel. A drainage map of 1898 has been the greatest gift to us in our archaeological activities. 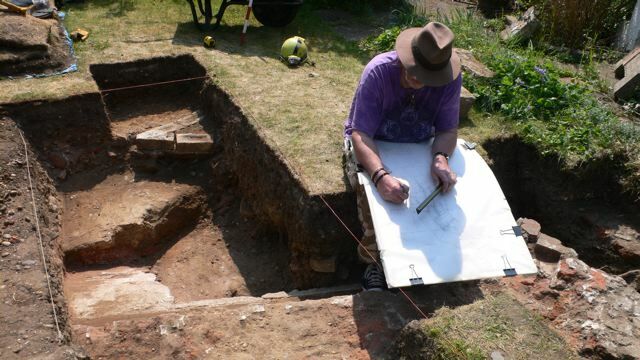 We have managed to trace the Georgian Hall footprint across a number of gardens and therefore known which rooms in the domestic part of the Hall we’ve been excavating. There is still work to do! We have a line of four wells running away from the Hall site down Cedar Grove to The Drive. These have often been sealed for safety reasons down the years. A bath house for taking the waters was erected on the southern edge of the estate adjacent to the River Shuttle at some time between 1825 and 1863. Today the building would be located south of Bladindon Drive, east of the junction with The Avenue. We’ve also found the likely position of the ice house (on Blendon Road) but it appears to be sitting under a heavily paved and concreted front garden. And there is the quest for the location of the Elizabethan Hall which was destroyed in the 1760s after the later Hall was built. This was said to be immediately east of the later Hall (which was demolished in 1934), ie on the East side of Beechway towards Blendon Drive.